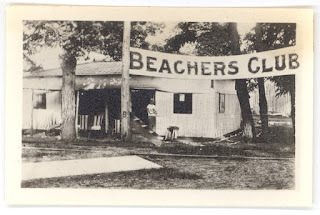 Rare photo of the Beachers' Club. With spring just around the corner and our recent blast of warm weather, I know that many of us are looking forward to summer and all the activities we'll be able to enjoy. 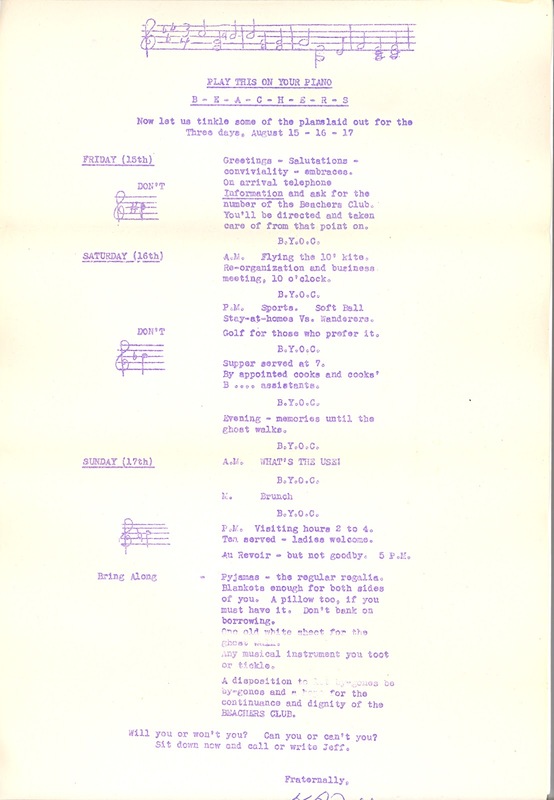 I recently dug up some interesting material from the Beachers' Club, a group of young Sarnian gentlemen who "believed that summers were endless, nights filled with music and pretty girls and that the days of youth would never end." (Red Wilson from the Observer, July 28, 1978). The Beachers' Club was founded in 1914. Founding members of the club include two WWI veterans, Harvey (Hot Dog) Douglas and Reg Savage, and characters like Moon from Ingersoll (who reportedly always brought a book to read but never got around to reading it). The tincovered building was located where the Sarnia streetcar turned sharply east near the Grandview (or Wees Beach) Hotel, just off Lake Huron. If you're trying to place that location on a modern map, it's at the end of Colborne Road! 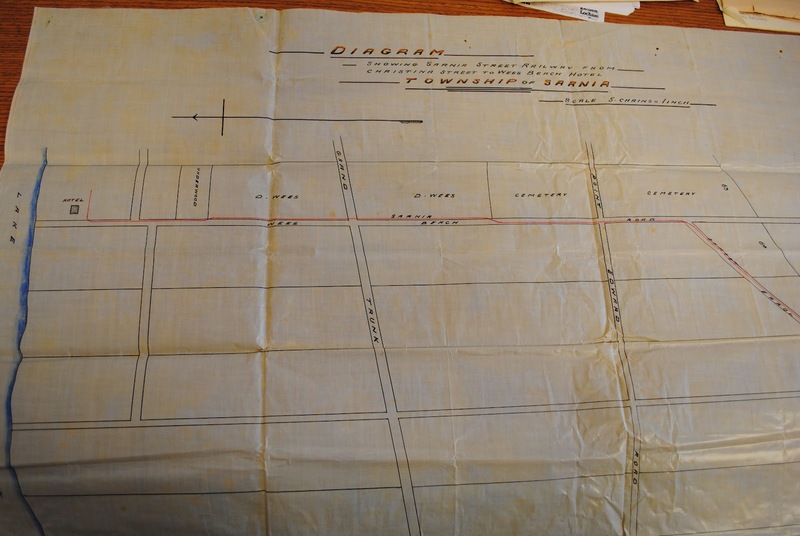 This diagram shows the path of the Sarnia Street Railway heading towards Lake Huron, and the Wees Beach Hotel. Image the Beachers' Club nestled near where the streetcar takes the sharp turn east. 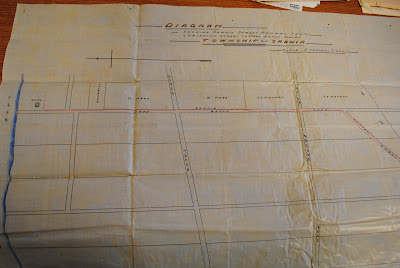 Diagram published June, 1904 and entitled, "Diagram showing Sarnia Street Railway from Christina Street to Wees Beach Hotel, Township of Sarnia." 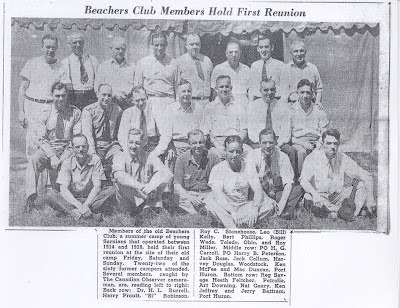 In the Observer of July 28, 1978, Red Wilson wrote a history of the Beachers' Club and gave this description of their clubhouse: "The Club held no secrets. It was open for all the world to see. About June the front was lifted to make a sort of patio roof. The interior, festooned with pennants, was a landmark from its inception until it moved across the road into a new and more substantial building. The new headquarters were more modern, sophisticated and roomier than the old. But they lacked that touch of glamor of the old." 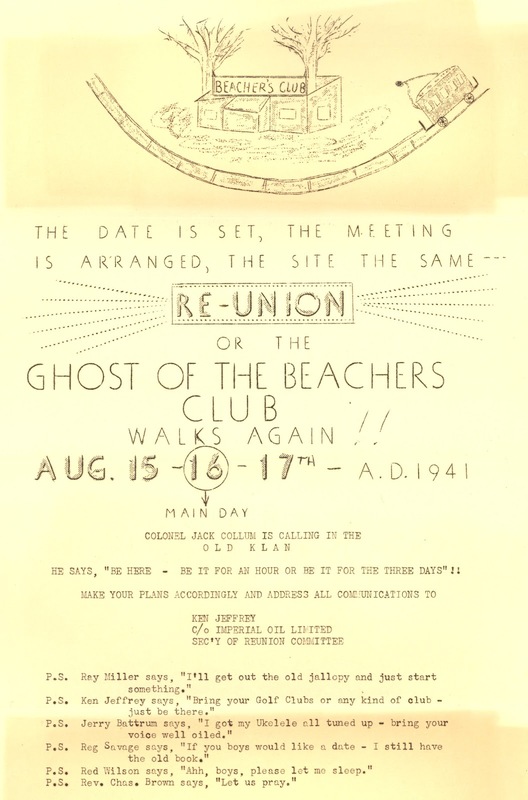 A disposition to let bygones be bygones and a hope for the continuance and dignity of the BEACHERS CLUB. 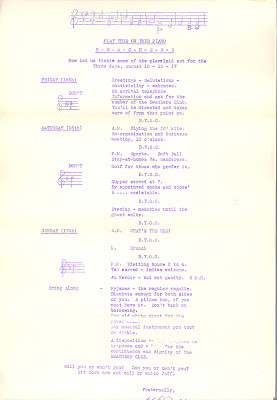 Jerry Battrum, "I got my Ukulele all tuned up - bring your voice well oiled." Reg Savage, "If you boys would like a date - I still have the old book." Ray Miller, "I'll get out the old jallopy and just start something." Red Wilson, "Ahh, boys, please let me sleep!" Sounds like they enjoyed friendship, a bit of mischief and long summer days. Hopefully we can all enjoy these things as spring will soon turn to summer! Red Wilson reminisces fondly in the Observer article mentioned above, "They were good days then." 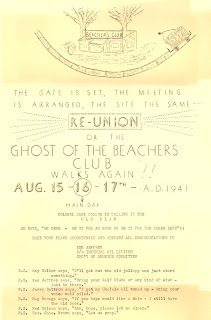 Twenty-two of the former campers invited would attend the 1941 reunion. This picture appeared in the Observer the week after the reunion in August. I LOVE this!! Thanks so much for posting. Anything to do with the old beach communities and beach life back in the day fascinates me! Very glad you enjoyed it! I'm sure that Grand Bend will feature in a blog this summer so keep posted for more of Lambton County's beach history!